The death of Alexander the Great gave rise to the kingdom which was created by one of his leading generals, Seleucus Nicator, who ruled a vast empire stretching from the Mediterranean to parts of northern India. He was subsequently weakened in the Indian sub-continent by the Maurya empire. This led his satraps in Bactria (the region between the Hindu Kush and the River Oxus, now northern Afghanistan, plus southern areas of Uzbekistan and Tajikistan, and eastern Turkmenistan) and Parthia (north-eastern Iran) to think in independent terms. For the greater part of their existence they were cut off from the west, so records on nearly all the Indo-Greeks are ambiguous and fragmentary. Diodotus, the governor of Bactria, was the first to rebel against Antiochus (250 BC), the Seleucid king. Antiochus was ignoring his territory in the Indian sub-continent due to his concentration in the eastern Mediterranean region. Taking advantage, Diodotus set himself up as an independent ruler in Bactria. Later on, another satrap , Euthydemus defeated Diodotus' son and founded the Euthydemid dynasty. His son, Demetrius I (195-180 BC) led his Indo-Greek armies to the south-east of the Hindu Kush mountains. Demetrius was followed by Agathocles (c.180-165 BC). He may have been a contemporary or successor of Panteleon (probably the younger brother of Demetrius), whom he replaced. He was in charge of Paropamisadae (between Bactria and India, centred mostly on Punjab and Kashmir). His throne was usurped by Eucratides, who pushed Agathocles back to Bactria and established his own lineage in Paropamisadae. Then there was Antimachus I Theos (c.180-165 BC ? ), probably a brother of Demetrius, who ruled Bactria and lower Kabul. Parts of his kingdom were probably annexed by Eucratides. The next known Indo-Greek king was Apollodotus I (c.180 or 175-160 BC). He was one of the generals of Demetrius, and is credited with establishing the first Indo-Greek kingdom ruling areas of Taxila in Punjab, and areas of Sindh and possibly Gujarat. Later on a second king by the name of Demetrius (175 or 170-165 BC) came to rule large areas in southern Afghanistan, Punjab and the Indus Valley. Amongst the later Indo-Greek kings was Antimachus II Nikephoros (165-166 BC), probably the son of the earlier Antimachus. He had fought against the usurper, Eucratides, and ruled over the vast territory from the Hindu Kush to Punjab. He is credited with the introduction of tax receipts. However, the best-remembered of the Indo-Greek kings was Menander I Soter (c.155-130 BC), otherwise known as King Milinda in Indian texts. Milinda achieved fame due to the Buddhist text, 'Milinda Panha'. It is an account of a long discussion conducted between Milinda and Nagasena, a Buddhist monk. This led to Milinda's acceptance of Buddhism. Milinda also created a vast empire from central Afghanistan as far as western and central India. His capital remained at Sakala (Sialkot). 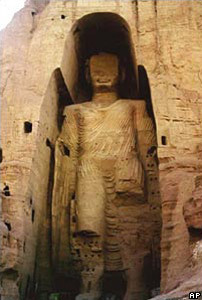 Milinda proved himself to be a patron of Buddhism and he himself was a reputed scholar. He enjoyed tremendous popularity amongst his subjects, and as per the accounts of Plutarch, after Milinda's death, all his cities vied for his ashes. Following the rule of the Milinda 'dynasty' (including his son who succeeded him), there were many kings, notably Zoilus I (c.150-125 BC? ), who ruled in Paropamisadae and Arachosia (southern Afghanistan), and who was from the Euthydemus line. Lysias Aniketos, the Invincible (c.130-120 BC), was a close successor of Zoilus , and claimed descent from Demetrius I. There was a Strato I, son of the Indo-Greek queen, Agathokleia (c.120 BC? ), both of whom ruled in areas of Gandhara and Punjab, and the latter is considered to be the widow of Menander I (although this is disputed by some), and was probably a contemporary of Lysias. The Indo-Greek kingdom had divided into Paropamisadae and Arachosia on the one hand and Gandhara and Punjab on the other. Once this had happened, there was a slew of apparently short-lived rulers who are very poorly documented. Included in these were Antialcidas of Paropamisadae (fl c.120 BC? ), Heliocles of Gandhara (c.110-100 BC), Polyxenios of Paropamisadae (fl c.100 BC), and Demetrius III (fl c.100 BC) of Gandhara. Following them there was Philoxenus (100-95 BC), who ruled entire regions from Paropamisadae to Punjab, Diomedes (c.95-90 BC), who ruled Paropamisadae, Amyntas (c.95-90 BC), who ruled Afghanistan, Epander (c.95-90 BC), who ruled Punjab, Theophilos of Paropamisadae (c.90 BC), followed further by Peukolaos of Gandhara and Thraso (both c.90 BC), who ruled central and western Punjab, Nicias of Paropamisadae (c.90-85 BC), Menander II (c.90-85 BC), who ruled Arachosia and Gandhara, Artemidoros (c.90-85 BC) in western Punjab, Hermaeus in Paropamisadae (c.90-70 BC), and Archebios (c.90-70 BC) in Gandhara and Pushkalavati / Peshawar. Artemidoros is also claimed by some scholars as being a son of Maues, the Indo-Scythian king of the Sakas. Whatever the truth of that, somewhere in between that mass of Greek rulers, Maues himself (85-60 BC or c.90-60 BC) conquered Taxila and established his kingdom in modern Pakistan. Despite this setback, the line of Indo-Greeks continued. Telephos (c.75-70 BC) ruled Gandhara (probably as a briefly dominant Indo-Greek successor to Maues), and Apollodotus II (c.75-70 BC) belonged to the dynasty of Menander I, ruling in Punjab. Hippostratos (c.65-55 BC) ruled Punjab and Peshawar, and Dionysios (c.65-55 BC) ruled eastern Punjab. Zoilos II (c.55-35 BC) ruled eastern Punjab, as did Apollophanes (c.55-35 BC), although it isn't known whether this was before, after or along with Zoilos II. Strato II (c.25-10 BC) ruled eastern Punjab. He was the last Indo-Greek king after his territory was invaded by the Indo-Scythian king, Rajuvula of Mathura (in Uttar Pradesh state). There is also mention of Heliodorous, who was either the king of Taxilla or the king's envoy. He was a devotee of Lord Vasudeva (or Vishnu - a primary Hindu God), and was responsible for erecting a structure known as the 'Garuda Dhwaja' in honour of Lord Vasudeva. 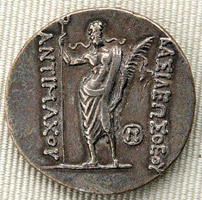 The Indo-Greeks introduced a lot of innovations in the coins that they made. They used the technique of die striking in the manufacture of their coins. Their coins all bore portraits of the rulers, something which was employed by the later Indian kings, although many of the less powerful kings over-stamped coins of previous rulers with their own mark. Greek astronomy is also considered as being a gift to India, as per the Brahmin text 'Gargi Samhita' , and Indian astronomers such as Varahamira. Greek sculpture also left an indelible mark on Indian arts and culture. In return the Greeks were influenced by Hindu and Buddhist philosophies and rituals, resulting in many of the Indo-Greek kings embracing these religions. The Indo-Greeks ruled in India for two centuries (up until first century AD), although Hellenistic influences and pockets of Greek culture remain for some centuries after that. Their movement eastwards into India paved the way for the Sakas (otherwise known as Indo-Scythians), the Pahlavas (the Indo-Parthians), and the Kushans (the Yuezhi or Kushanas). The Brahmin text 'Gargi Samhita' (the Yugapurana section), is also critical of the Greeks, or Yavanas as they were called, for their brutality in the Indian sub-continent. The Yavanas have been termed barbarians for their approach, but as per Romila Thapar, this may have been thanks to their patronising of Buddhism, and newly emerging Hindu sects such as 'Shaivaism' and 'Bhagvatism', at the cost of Vedic Brahmanism.